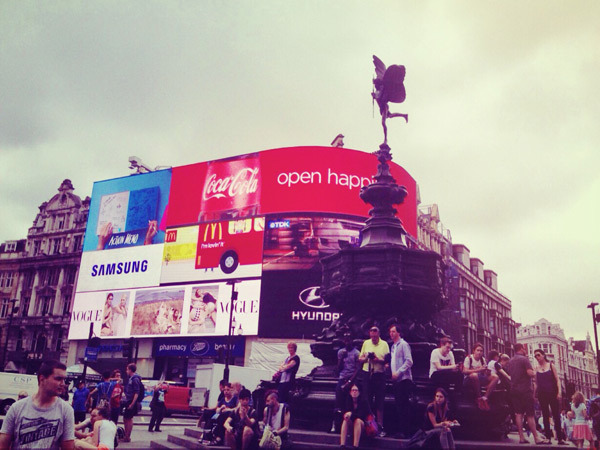 Sitting on the Eros fountain, Piccadilly Circus, London, between 13.40 - 16.46 23rd June 2014. A visit to London combined with the perennial desire to wander the streets led me from the relative quiet of the canal at Little Venice to the heart of the West End where I found myself staring at all the people who were in turn staring at the famous Eros fountain in Piccadilly Circus. I carefully wove my way through the various people sitting on the surrounding steps and found a spot to sit on the fountain and was soon lost to people watching: The kid ticket tout (couldn't be older than ten) casually fanning out flyers all the while sharking for an easy mark, the Rastafari busker clearly enjoying peddling guitar classics through a straining portable PA and the awkwardness of a street performer taking a cigarette break from 'floating' as he broke out of his Harry Potteresque costume determined to avoid revealing the support for fear of accidentally shattering the illusion. As I sat there tourist after tourist, using every imaginable kind of technology, took a snapshot of their travelling companion standing in front of the Eros fountain and so instantly gained proof of their having been there. But what quickly became apparent was that many of the photos being taken had me, and countless others, clearly in the picture. I stayed there for just over three hours passively photobombing hundreds of people's holiday snaps - they will never know me and I will never see the photos yet with ever more calculated intrusion I now appear in the background of the photos of holiday makers from all around the world. Those holiday makers now hold the proof to my existence - for if it has been photographed but it's not been put online then, as argument would have it, it doesn't exist. Image supplied courtesy of Jackson Bateman. An iPhone retro-filtered snapshot taken four weeks after my being there.